After my folks split when I was a kid, I moved with my mother to Iowa, and spent time each summer visiting my father in Albuquerque. He worked on the University of New Mexico campus, and so on weekdays, when I was a bored adolescent, I'd walk down to campustown and spend hours milling around, visiting shops, getting coffee and loitering. I had a full circuit of comics shops and bookshops that I'd try to visit regularly: The Book Case, The University Comics Warehouse, Birdsong bookstore, Living Batch bookstore, Newsland, Addicted to Comics, Salt of the Earth bookstore... all within about a half mile radius. Most of these are now defunct, sadly, but when I was in middle school I spent hours and hours in each of them, nurturing a love for science fiction, horror, and humor; and then more hours in The Frontier restaurant, reading what I'd picked up. One of my favorite shops was a little gem called Best Price Books. It had a little cafe and coffee shop, where I was first introduced to the concept of the italian soda (my preferred was blueberry with cream) and the latte. They also had a good array of books... and a huge selection of super-cheap comics. That wasn't uncommon in used bookstores, of course. The late 80s and early 90s were a strange time for comics, and there was always a lot of inventory to be picked up for pennies on the dollar. Most places had the same old stuff-- runs of subpar Marvel and DC books, or reams of kiddie comics (Richie Rich consistently occupied feet of space in ratty long boxes, ferreted away in bookstores' dark corners). But Best Price Books had weird stuff. A full run of Star*Reach comics. Cerebus. Big chunks of The Fabulous Furry Freak Brothers and Fat Freddy's Cat. A few scattered issues of Beautiful Stories for Ugly Children. Ted McKeever's brilliant and bizarro Eddy Current (which got me into trouble when I took it into my fifth-grade Art class and tried to show it off). Even a few copies of Zap and Raw and Weirdo, along with myriad underground one-shots, also-rans and never-weres. They had the usual Marvel and DC stuff too, but mixed in with the Justice League America and Marvel Tales you'd find stuff like Watchmen and Wasteland. They weren't always in good shape, but they were always cheap. I bought so many weird comics. If my parents had known the depths of the art-house weirdness I was plumbing with these things, they would've either snatched them away in a heartbeat, or congratulated me on becoming a weirdo early on. I didn't let them know what I had. I credit those outings-- those comics, those movies, those shops, those people-- with turning me into a weirdo in the best possible way. One of the comics I found in the super-cheap bin at Best Price Books was a black and white comic from the UK publisher Harrier. I'd known about them already, because I'd already found-- in the same bookshop-- some issues of Deadface, Bacchus, and Avalon. This one was called Some Tales From Gimbley. I picked it up, flipped through it as I sipped a beverage of some kind or another, and was immediately hooked. Gimbley was different from almost anything I'd come across. It wasn't a superhero comic. It wasn't a funny animal comic (or a martial arts fighting-animal comic; those were rampant in those days, after the success of TMNT). it wasn't Science Fiction, it wasn't Horror, it wasn't sword & sorcery. 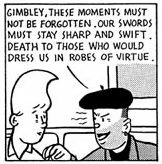 The closest thing I had to compare it to were the slice-of-life stories in some of the black-and-white underground comics, but those leaned toward the edgy and dirty, and Gimbley was much more gentle. These were short little vignettes-- many of them only a single page long-- incorporating humor, magical realism, poetic language, absurdity, and a permeating wistfulness. 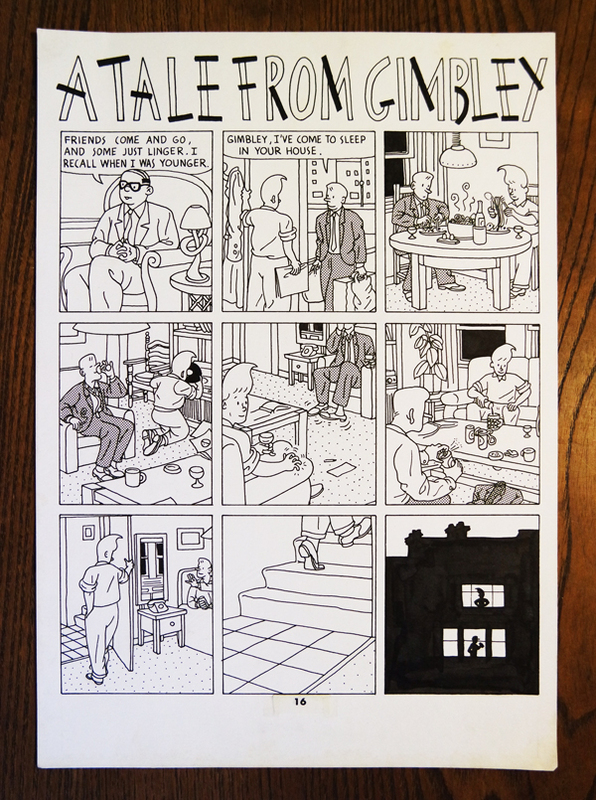 This was comics in a form I'd never seen before-- as sequential graphic poetry. A few years after discovering Gimbley, while in high school, I went on a trip to Denver with my mother, and found a copy of John Porcellino's King-Cat Comix & Stories in a comic shop. King-Cat hits many of the same notes: wistfulness, clean linework, the incorporation of poetic language and imagery, zen calm. But Gimbley was absurd and funny, in a way that King-Cat usually isn't. These were the days before the internet, and Harrier was a UK publisher, so it was years and years before I was able to track down more of Phil's work, but I carried that copy of Tales From Gimbley wherever I went, reading and re-reading it until it was in tatters. In high school, I used Elliott's Scenacre Cottage Gimbley short as the basis for a short-short story. I don't remember if I mentioned the inspiration to my teacher; knowing who I was 25 years ago, probably not. Sorry, Phil. 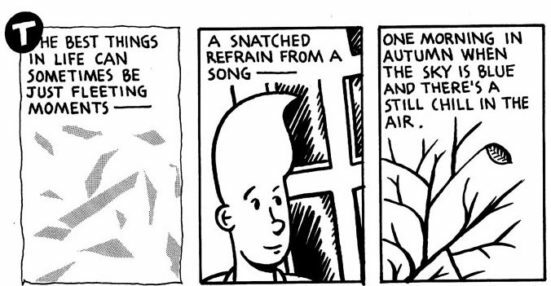 One of the things that amazes me every time I reread Gimbley is Phil's style, how malleable and fluid it is. 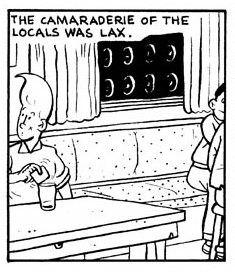 Sometimes he uses incredibly clean linework, in the style of Joost Swarte or Hergé, but then the next page features thick and chunky slashes of expressionist cartooning, and I loved that he could bounce around between these styles, apparently effortlessly, so effectively. A few years ago I became Facebook friends with Phil, and commissioned him to draw a family portrait. His work hangs up on the wall next to James Kochalka, Chris Onstad, Ivan Brunetti, Jeremy Bastian, John Porcellino, and Keith Herzik. Recently, Phil posted on his Facebook. "I've decided that I can't keep lugging all my artwork around and am selling everything and anything." It's difficult to express the delight and excitement I had when I opened up the package and held the original art for those pages in my hands-- those pages I read in one of my favorite bookshops as an adolescent a quarter-century ago, those pages I'd re-read dozens of times over the years, those pages that informed, entertained, and delighted me. I think I'll hang the first one in the guest room. 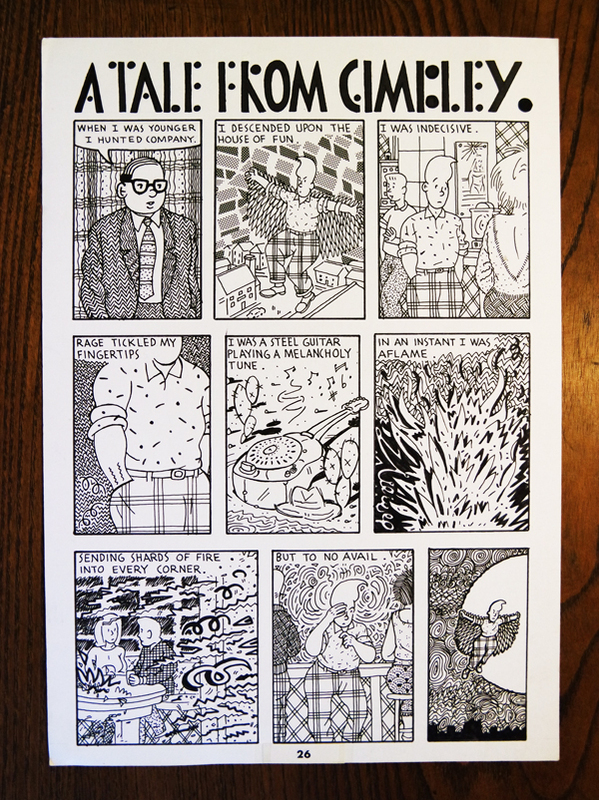 Phil recently collected all of the Tales From Gimbley in a self-published collection called In His Cups. You can get a copy from him, at an unbeatable price, here, and I'd recommend that you do so. You can also visit his website here, and if you want to read more Gimbley, he's put a bunch of them up online here.